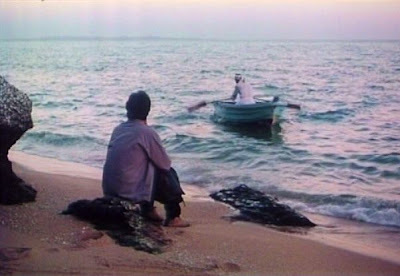 Silence of the Sea (Khamushiye Darya, 2003), the second feature written and directed by Vahid Mousaian, is a somewhat mysterious and meditative film a bout an Iranian expatriate who wishes to reenter his native country and exhume some psychological ghosts that are haunting him. Like many films from Iran, it implicitly depicts the inner, emotional turmoil of the principal character during the course of everyday activities over a relatively short period of time. The story concerns Siavash, who had left Iran years ago and gone to Sweden, where he married a local woman and has raised a family. At the start of the film he has apparently rather abruptly decided that he must return to Iran, after so many years, and settle something in his mind. The entire film is about his attempt to return. Stylistically, the Silence of the Sea has affinities with the work of Abbas Kiarostami, such as in, for example, The Wind Will Carry Us. There is a focus on one person and his reaction to his surroundings, as well as the use of cell phones to evoke the notions of “communication”. In addition the technique of “slow disclosure” is used to plunge the viewer into a strange situation and only very slowly provide scraps of information, bit by bit, that reveal the context and what is going on. Kiarostami pushed this technique to an extreme in The Wind Will Carry Us, with slow disclosure extended throughout the film. But Mousaian has gone even further with Silence of the Sea: many presumably significant things are never disclosed in this film. This will be either intriguing or maddening, depending on your taste. Fortunately, the lead role is ably played by Masoud Rayegany, who has also appeared in Kheili Dour, Kheili Nazdik (So Close, So Far, 2005) and Ali Santouri (Santoori, 2007). His under-stated performance maintains continuity and reasonably well sustains our interest during the cryptic proceedings. The story begins with seven minutes of point-of-view shots, which are evidently meant to depict the mental recollections and reflections of the main character, to whom the viewer has not yet been introduced. During this sequence one learns that Siavash has a Swedish wife and two children and that his own aged mother and father had sent him a video tape of themselves reproaching him for leaving them all alone back in Iran and never returning. 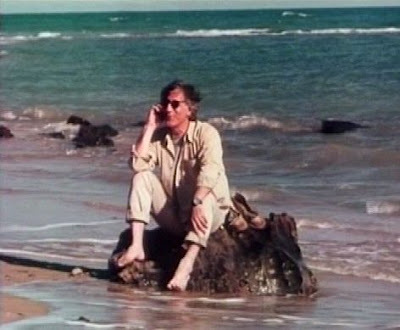 Finally, after those seven minutes, the mental reflections are broken up, and the viewer sees Siavas h on a small boat heading for his destination port: the island of Qeshm. Qeshm is a large island a few kilometers off the southern coast of Iran in the Straits of Hormuz, near the port of Bandar Abbas. A part of Qeshm (about one-fifth) is a free zone, which means that you can go there without a visa, and this is crucial to the story. Apparently Siavash left Iran illegally years ago, and he cannot safely return to Iran, but he can enter the free port and speak to the local people there in his native language again. In the early stages of the film, Siavash amiably enjoys taking in the local Iranian culture and activities in Qeshm. 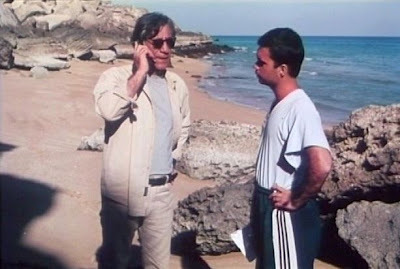 He befriends a local boatman and tout, Abdo, who sells him a cell phone. As most people know, this is what one needs to do in order to communicate clandestinely: buy a cell phone with a new SIM card in order to retain your anonymity; then throw away the SIM card after your telecommunications are completed. Siavash calls his wife back in Sweden and then calls an old friend inside Iran, Hussein (he is never shown in the film), with whom he converses concerning how they can safely meet later, inside Iran. 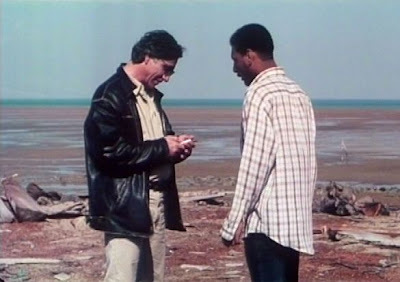 A little later Siavash takes a walk along a deserted area of the Qeshm shoreline and sees a number of people in a boat struggling to make it ashore while dodging gunfire from some pursuing police boats. Siavash meets one of these refugees on the shore, Faramarz, who reluctantly explains to him that he and his colleagues are all innocently trying to get out of Iran, but that the authorities won’t let them. Note that Iranian citizens need an exit visa to leave Iran. One cannot legally leave the country while still under certain obligations, such as the requirement to serve in the military. In this connection one might speculate that Siavash might have left Iran years earlier in order to escape the devastating and traumatic Iran-Iraq war, which took some 700,00-800,000 Iranian lives. If Siavash had avoided his military service in this way, he would still be liable for arrest if he were to return. Possibly supporting this conjecture is the fact that throughout the film, there are low-flying aerial photography images that apparently reflect Siavash’s memories or dreams of some past situation. It is not clear what the images mean, but to me they suggest a view from a military aircraft. In any case it is clear that Siavash sees a mirror image of himself in the young Faramarz. Faramarz borrows Siavash’s cell phone and calls his mother, explaining to her that he only wants to leave Iran in order to go out in the world and make something of himself. This apparently reflects Siavash’s original ambition for leaving Iran, too. After this encounter, there is another cell-phone call with Hussein, during which Hussein admonishes Siavash for leaving Iran in those old days. The conversation is cryptic concerning what those original circumstances were, but Hussein explicitly condemns Siavash for having abandoned his parents. Afterwards, the guilt-driven Siavash attempts suicide by wandering into the ocean, but a local fisherman rescues him and brings him back ashore. Because his cell-phone reception is unreliable at times, he tries using a local community phone, which is operated by a beautiful young woman who is the dream girl of all the young men in the area. Siavash goes out in a boat with Abdo along the coast and once more sees Faramarz and the other refugees immersed in the water, holding on to inner tubes, while hiding in the local marshes. Precisely what these refugees want to do at this moment or where they want to go is unclear to me here, but Siavash's encounter with them and his sympathies for their plight causes him considerable anguish. 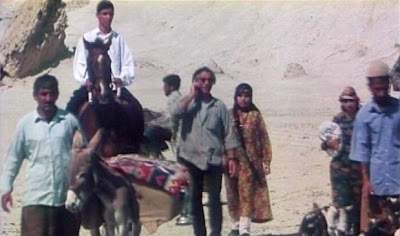 Later Siavash is out in the Stars Valley of Qeshm and has a vision of himself as a young boy in a caravan of traditionally-dressed travellers on horseback that is b eing led by his father and mother. Although the cavalcade presents the young Siavash as a capable boy fulfilling his filial obligations, the precise meaning of this colorful vision, in which the "real" Siavash is oddly able to intermingle with the travellers, is unclear. To whom Siavash is referring is unclear – his parents, Abdo, Faramarz, Hussein, someone else? In any case the next morning there are grim images of an empty boat and Abdo’s forlorn mother that suggest Abdo may be dead. Finally, Siavash is resolved to go across the border and hires a private dinghy to take him to Iran and meet up with Hussein on the other shore. He gets most of the way there, but his pilot is suspicious about being involved in illegal activity and refuses to take him all the way. This somehow breaks Siavash, and he realizes that his overall mission (whatever it was) has ended in failure. Silence of the Sea is tantalizing and has some suggestive moments, but, for me, it is a narrative failure. Despite Rayegany’s efforts as Siavash, the individual pieces never add up to anything. It is difficult to empathize with Siavash’s guilt (whether it concerns his parents, a lost love, or some unknown past activities) without having the contextual grounding available. Guilt, longing, isolation, and “making something of oneself” seem only to be abstractions. Whenever there is love, there must be “the other”. Otherwise, one only has solipsism.